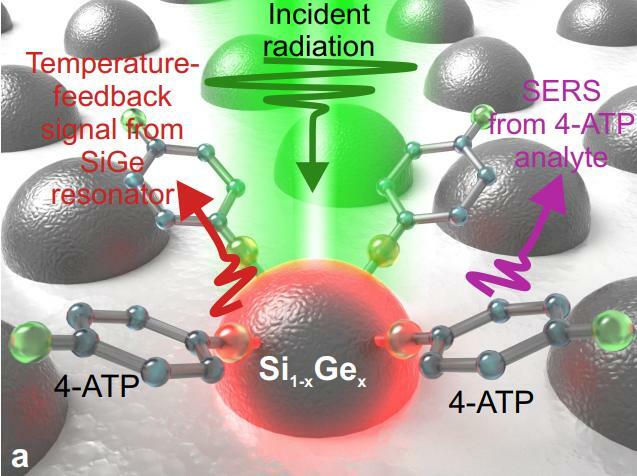 VLADIVOSTOK, Russia, April 3, 2019 — Scientists at Far Eastern Federal University (FEFU) have devised a method for efficiently mass-producing silicon-germanium (Si-Ge) fully alloyed nanoantennas. The researchers’ cost-effective approach to large-scale fabrication of Si-Ge alloyed Mie nanoresonators can be tailored by tuning the Ge concentration. The deposition of Ge in the process of silicon-on-insulator (SOI) dewetting can produce alloyed nanoparticles with unique properties, said the researchers. The technology used to fabricate the all-dielectric (AD) optical nanoantennas was based on a temperature-assisted dewetting of commercial SOI substrates at 800 °C in high vacuum, which led to the formation of silicon nanodrops that could be used as optical nanoantennas. The research team, which included scientists from the Far Eastern Branch of the Russian Academy of Sciences (FEB RAS), ITMO University, and Swinburne University of Technology, used these nanoantennas to identify adsorbed molecules and access the local temperature with a high level of accuracy. Artistic representation of the alloyed Si1−xGex nanoparticles with 4-ATP molecules adsorbed on their surface. An isolated Mie nanoresonator is pumped with laser radiation resulting in SERS from the attached molecules as well as Stokes Raman yield related to Si1−xGex lattice phonons, providing information on the local temperature of the molecule-nanoantenna system and corresponding spatial position the nanoresonator. Courtesy of FEFU press office. Kuchmizhak said that effective temperature-feedback modality cannot be realized with the plasmonic nanoantennas commonly used to design biosensors. “All-dielectric nanoantennas provide a reliable way to achieve this feature, as the measured characteristics spectrum of the analyte molecules already contains all the information required to determine the local temperature of the ‘nanoantenna-molecule’ system,” he said. By controlling the concentration of Ge in the alloyed Si nanoparticles, the researchers found that they could tailor the nanoparticles’ properties. Specifically, they could control the nanoparticles’ resonant optical characteristics, as well as their light-to-heat conversion efficiency. “This is very useful for studying various chemical processes and reactions induced by laser radiation,” said researcher Evgeny Mitsai. By using AD nanoantennas, the temperature-mediated effects in laser-induced chemical reactions at high temporal resolution can be studied in detail. Moreover, the researchers said, AD nanoantennas are chemically noninvasive. Their presence — unlike the presence of plasmonic-based nanoantennas — has no effect on the analytes and reactions being examined. The AD nanoantennas could be used in biological and chemical sensors for tracing low concentrations of viruses, pollutants, and explosives. The research was published in Nanoscale (http://dx.doi.org/10.1039/C9NR01837A).